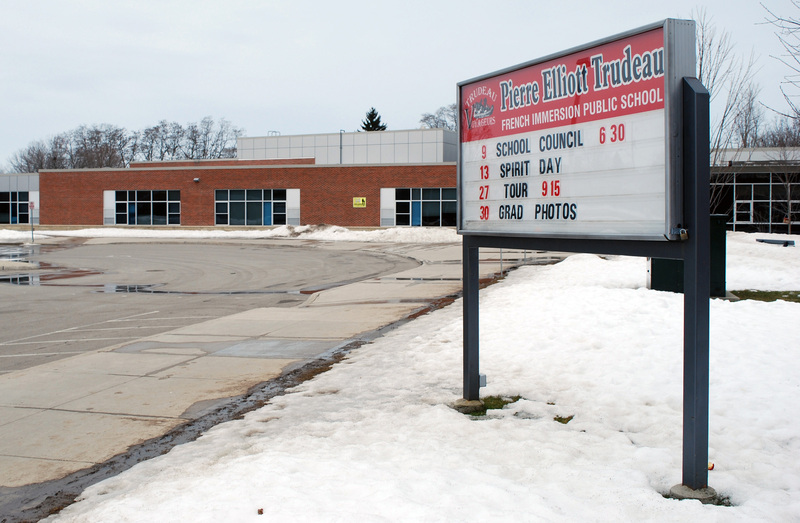 The ‘re-designation’ of 240 students to Port Stanley Public School was one of several short-term solutions considered, advises a member of the school council at Pierre Elliott Trudeau French Immersion School. And one of the options would have seen those students returning to Wellington Public School, where most of them attended prior to the opening of their new home in the former Homedale Senior Elementary School. It’s a possibility that may yet see the light of day, advises St. Thomas CAO Wendell Graves. “Anything is possible,” Graves says. “One of the committees of council relates to the courthouse/Wellington block area and they have met a couple of times to work through a couple of potential strategies for that Wellington block which Algoma (University) will be done with at the end of the school year. The population at Pierre Elliott Trudeau French Immersion School has ballooned from 494 students in 2010 to 780 in 2014. To handle the crush of students, 11 portables are now housed on the school grounds. A recommendation approved in December, 2013 would see an addition in place for the 2016-17 school year, contingent upon Ministry of Education approval. Tammy Logtenberg, a member of the school council at Pierre Elliott Trudeau French Immersion School, confirmed to the Times-Journal in an email this week less than three dozen parents attended the January meeting where a survey on possible options was distributed. Logtenberg adds that is fairly typical of the turnout for any council meeting. She notes parents should have been well aware of the meeting to deal with overcrowding at the school. “Agenda items and minutes are always posted on the school’s official website by school staff for parents to view, then decide if they’d like to attend. The school reaches its parent population via its newsletter. Earlier this week, Julie Karathanassis of St. Thomas told the Times-Journal she and other parents were unaware of the January meeting as no letter was sent home advising of the open forum. Instead the meeting was advertised on social media and on the signboard in front of the school. Logtenberg points out newsletters were distributed on Sept. 18, Oct. 10, and four times in January on the 5th, 12th, 20th and 26th. A transition team will be established at the school to deal with issues like extra-curricular activities such as sports teams and clubs. Also the fear expressed by some parents French Immersion students in Grades 6-8 and Grade 7 and 8 Extended French students who will attend classes in Port Stanley will become isolated from their home school. Dealing with overcrowding at the school is an issue that dates back to 2013 Logtenberg advises. “It’s not new. Even when the board threatened to send away 40 kids due to boundary changes, parents barely showed up. Council still represented those parents and we kept those 40 kids. This entry was posted in Education, French Immersion, Thames Valley District School Board and tagged Education, French Immersion, Pierre Elliott Trudeau French Immersion School, Thames Valley District School Board. Bookmark the permalink.